By now everyone has seen the outrage-inducing image of a third grader’s paper in which he is marked down for stating that 5 x 3 = 5 + 5 + 5 = 15. 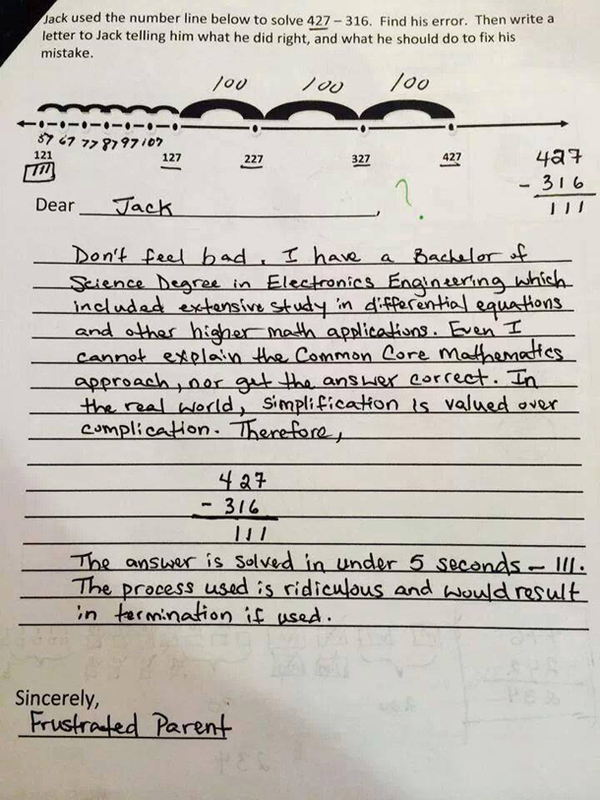 In case you missed it, here are videos and stories from several groups ripping Common Core for it: Business Insider, IFLScience, Huffington Post and mom.me — and I’m sure you can find many more as the photo of this kid’s paper has gone viral. 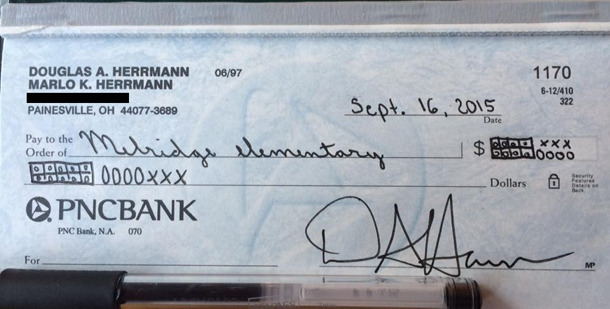 You might also remember the photo of a check that went viral not that long ago — a man filled out a check to his son’s school by attempting to write the check amount in ten frames. There have been countless other similar photos with accompanying derision that have gone viral via social media and email (more on these examples in a moment). In the national discussion on America’s perceived educational woes, the Common Core Standards have become a bit of a unifying punching bag, especially with respect to elementary school math. Everyone seems to love a photo of a test question, homework problem or corrected work that vilifies the Common Core. You know the type — the question asks the students to show a seemingly straightforward elementary math topic, but it requires the answer to be given in what seems to be an overly complicated way. We look at it and say, “Why can’t they just do it the normal way?! ?” We are alarmed at the representation of something that we see as so basic and elementary in a new and unfamiliar arrangement, and we are outraged when we see a student’s work marked down when it appears to be correct. The vast majority of the comments and coverage of these viral images and stories has been highly critical of the Common Core. Here’s the thing though — all of these criticisms boil down to a fundamental misunderstanding of the Common Core State Standards (CCSS). Consider the ten frames check (which falls into the first category) — the father was frustrated by a representation of numbers with which he wasn’t familiar and it fit nicely into his preconceived notion that the Common Core is terrible, serving only to confuse students and parents. Here is an article that does a more elaborate job of skewering his response, but in short, this father is upset because he doesn’t immediately recognize and understand a concept being taught to his second grader. Rather than try to make sense of it and understand the purpose, he ridicules it, and other similarly frustrated parents jump on board. In fact, ten frames are a way of visually modeling our counting system that help kids to better understand it. They were never meant to replace our current way of writing numbers — they are designed as a supplemental aid to assist in deeper understanding. It can be frustrating to parents, to be sure, to be initially stumped by your kids’ homework, especially when they’re in the earliest grades. Certainly, there are teachers out there who don’t always hit the mark with an assignment, or who fail to provide resources for parents to understand something that may be new to them, but in the end, let’s not forget that we’re all looking for the best educational outcomes for our kids. And let’s be honest, the way we’ve been teaching math for generations in America has not worked for everyone, which is why we have a very sizeable segment of our population who simply says, “I can’t do math.” So then why are we closed off to considering new ways of conceptualizing the foundational ideas of mathematics? Now consider the 5 x 3 question. According to IFLScience (which I love, by the way), Reddit and Imgur commenters expressed outrage at “the overly pedantic ‘by-the-book’ thinking.” The whole thing reads as an incrimination of Common Core as stifling mathematical thinking in favor of stringent and arbitrary definitions and algorithms. And yet, this is a completely wrong-headed interpretation of Common Core. The outrage is warranted, it’s just misplaced — this example is of the second type I mentioned above, in which the educator has misunderstood and misapplied the standards with an overly narrow literal reading of them. The standard in question says, “Interpret products of whole numbers, e.g., interpret 5 × 7 as the total number of objects in 5 groups of 7 objects each.” This teacher obviously read this standard as saying that the only way to view 5 x 7 (or in the case of the paper in question, 5 x 3) is as 5 groups of 7 objects each. So for 5 groups of 3 objects, that might look like 3 + 3 + 3 + 3 + 3. And yet, “e.g.” means “for example,” not “This is the only valid interpretation.” A reasonable reading of the standard by a mathematically literate person should allow for interpreting 5 x 3 as 5+5+5, or 3 groups of 5 objects each, especially when you consider that four standards down on the list is the one about commutation (along with other properties) in multiplication, e.g., 5 x 3 is equal to 3 x 5 (note, the e.g. I just used means that this is just one example; the property applies to infinitely many other pairs of numbers as well — see how that works?). The ultimate goal of these standards is to help our children to develop their foundational understandings of our number system and of basic arithmetic, and so if a student intuitively knows that 5 x 3 is equal to 3 x 5 and that they can both be represented as 3 rows of 5 items or 5 rows of 3 items or 3 stacks of 5 pennies or 5 piles of 3 apples or … well, you get the picture, then we’ve accomplished our goal! Interpreting multiplication in the way described above is not remotely new; rather, it’s pretty standard fare for understanding what multiplication is. Perhaps the idea of making students show the example on paper is more of a new phenomenon, and yes, the Common Core definitely advocates that educators encourage students to interact with ways of modeling the mathematical concepts they are learning so as to better master them. It does not, however, require stringent adherence to narrow, arbitrarily chosen interpretations of these models, and educators who focus their teaching in that way are doing it wrong. 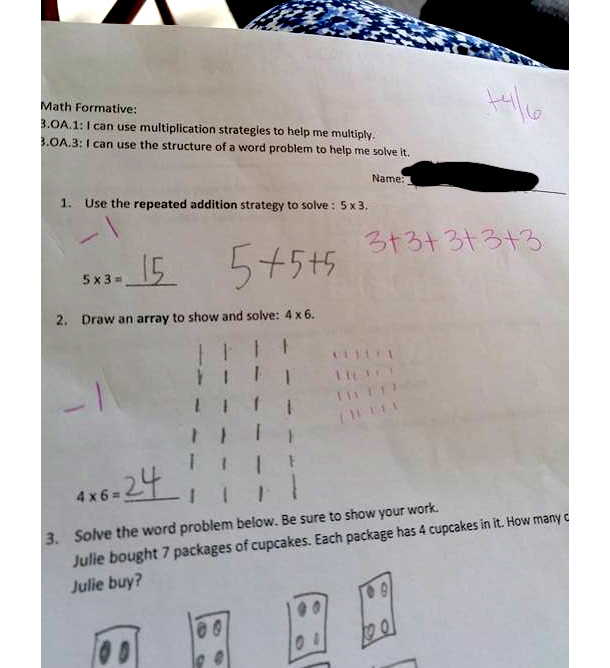 For another example, consider this image, which I first received in a forwarded email (this particular version of it was apparently taken from the web site of David Van Sant, a recent Republican candidate for the Georgia State House, who lost to a fellow Republican), about a math problem that has gone viral, helping to fire up people against Common Core. At first glance, the diagram of the Common Core approach might appear unnecessarily complicated, especially when compared to the setup of the standard subtraction algorithm that we all grew up with (not to mention that the image shows the setup of the standard algorithm but doesn’t actually show the process, which actually isn’t quite so simple with the borrowing that will be required). Most will look at the diagram of the number line, at a glance see a bunch of steps that don’t seem to make a lot of sense, and accept it as further evidence to support an already burgeoning outrage toward Common Core, thanks in part to a healthy side dish of confirmation bias. A closer look at the method, however, can reveal that the use of the number line (an important visual tool in arithmetic and algebra) allows this method to get at a different way of thinking about addition and subtraction and their relation to each other — a vital way of thinking for students who we would like to understand arithmetic on a deep enough level to facilitate the learning of higher levels of mathematics in a meaningful way (which should be essentially all students). The approach is a perfectly sensible way to give change for humans — it focuses on round figures that we can add and subtract more easily, and it focuses on the true essence of subtraction — the difference between the two referenced amounts. In the case of the change, it’s the difference between what you were supposed to pay and what you did pay (in other words, your change). The vertical subtraction algorithm we learned in school doesn’t make this clear — it is a memorized algorithm that can be done efficiently with pencil and paper by someone who has practiced it and it certainly can be made to make sense through study of our base ten number system by emphasizing the places of the various digits and the concept of borrowing when needed. When it comes to doing subtraction problems like this in your head, I suspect that most people who excel at this type of mental math use a method similar to the number line diagram that is shown (the supposedly laughable Common Core example). The ability to visualize and break up the problem allows someone to keep track of the values more easily and to more consistently and efficiently produce the correct result without putting pencil to paper. This problem is a bit cherry-picked in that it requires no “borrowing” in the standard algorithm, so this one is much more easily completed by that traditional method. And yet, the parent’s humor aside, the point of the number line model is not to teach the most efficient algorithm to perform subtraction, it’s to help students understand what subtraction is. I’m certainly not suggesting that we shouldn’t teach the standard subtraction algorithm that we all grew up learning, and neither is the Common Core. In the CCSS, it’s actually referred to as the “standard algorithm” for addition and subtraction, and the CCSS require that students completely master it for multi-digit numbers by the end of fourth grade. I am also not suggesting that the primary goal of math classes should be to enable students to perform complicated mental math without using pencil and paper. The goal of math classes should be to foster a deep-level understanding of the mechanisms that we teach, and that’s where compelling students to learn a variety of techniques for subtraction, for example, can allow students to approach a concept from a variety of different directions, using a variety of different tools, and tying it to other concepts they learn. This is, in a nutshell, what teaching mathematical understandings at a deep level should be doing. And this variety of approaches to build deep level understandings is exactly what the Common Core seeks to do. For all the griping about the CCSS, and in particular the math standards that people love to hate with these images of unfamiliar methods and models or of work that is inexplicably marked down, they’re actually pretty good. The idea behind them — in an attempt to improve on many of the learning standards that were out before — is to encourage depth of understanding, and they are definitely geared at that. They’re not perfect — as a high school math teacher, I have some issues with how much is crammed into certain courses and certain topics that may be overemphasized. But these things can be adjusted as time goes on, without scrapping them entirely. Or even if they’re not improved, a capable and competent teacher should find the CCSS to absolutely be a workable set of standards — an improvement over what we had before. What we need, in order to do the best job of teaching with these standards, is the best group of teachers possible, as well as a stronger national emphasis on the value of education. The last thing we need right now, in my opinion as an educator, is to start over again with a new set of standards just as we’re getting used to the Common Core. Jim Goodman is a high school mathematics teacher in Northeast Ohio where he lives with his wife and three daughters. He has a Masters degree in Education, and has experience teaching in both private parochial and public high schools.